He is possibly the most adorable candidate running for office you'll ever meet. You just want to cuddle with him. His name is Bublik. He is a 3-month-old kitten who recently declared he wants to enter the dog-eat-dog world of Russian politics. The competitive kitty is ready to start kissing babies and shaking hands. 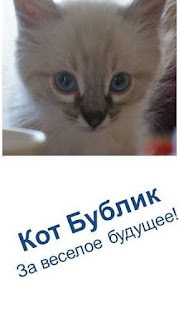 As reported by The Moscow Times, Bublik's press secretary, Ivan Kolotovkin, said that the cat's slogan is "For a Fun Future!" Bublik was encouraged to throw his hat into the ring, by the candidacy of Hank the cat. Hank is a former street cat running for Senate in Virginia. 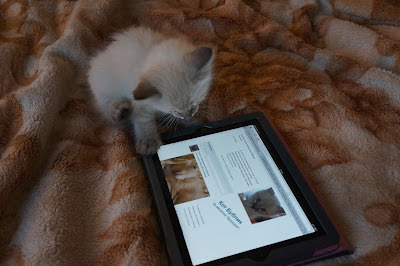 You can read more about Hank, in "Vote for Hank the Cat for Senate!" "If Hank the cat takes the U.S. Senate seat, cats between different countries could collaborate in productive ways," Kolotovkin said. Visit Bublik's Facebook page and wish this tough politician well. photo credits: Bublik's Facebook page. WOW! More kitties should run for political office, I think. I'm pretty sure that here in Canada, they'd be shoe-ins. No, not 'cause they fit in the shoes but rather because... well, you know... the reasons are far too numerous to mention. Finally, a cat running for office! I am not a political cat but I wish him luck! We would vote for Bublik, if we could!